C’mon, who can resist some tasty hummus? It’s creamy, flavorful, and makes vegetables even better. When I think about it, I actually don’t know many people who don’t like it. It’s great for a snack, great added to a lunch sandwich, and great served as a sauce or dip in most dinner recipes. Kabobs, anyone? Just home from a tough ride? How about a chicken hummus wrap for recovery? If you’re used to buying your hummus at the store, however, you may be missing the tasty-hummus boat. Not only is the flavor vastly different, you may also be adding ingredients you don’t want and missing ones you do – typical of commercial condiments, right? Never fear. 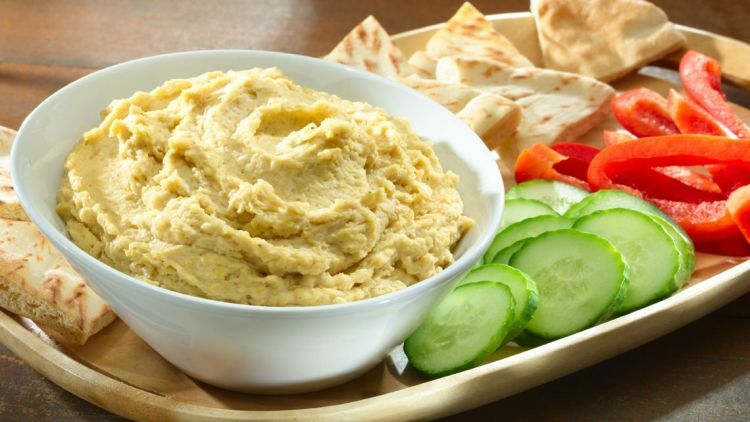 Here’s an easy, delicious hummus recipe. And, rather than eating a plastic tub full of preservatives, you can make a large batch of this hummus and preserve portions in your freezer. Natural, wholesome, and oh-so-good. Powerhouse Ingredient Add-ons: To increase protein and/or fiber, experiment with adding PB2 (defatted peanut protein powder), hempseeds and/or chia seeds. Begin with just 2 Tbsp of any of these ingredients and make sure to taste test as you go! If adding in Powerhouse add-ons, add 2 Tbsp of any ingredient and process to desired consistency. If desired, freeze individual servings. Twenty-four hours before serving, thaw in fridge. Add extra lemon juice and olive oil to taste immediately before serving. I’m often asked about store-bought hummus. Hummus is listed on my meal plans (along with this recipe) and clients often shy away from it and initially prefer to buy it. I completely understand, because it seems a whole lot easier to buy it than make it. Here’s a secret – it’s rather easy to make, and tastes so much different homemade than when loaded with preservatives from the store. And, turns out, it’s very inexpensive! What’s more, the nutrient profile is quite different between commercial and homemade. Since we’re dealing with a potentially great food for you, it’s important to get the most out of it. Protein, and Fiber: With any snack, I recommend protein and fiber. Both of these nutrients in combo, or by themselves, help promote steady blood sugars, satiety and health. The protein from the chickpeas offers a good, well-rounded vegetarian source. As a fiber source, chickpeas provide both soluble and insoluble fiber, making them great for digestion, immune function, and cardiovascular health. And, if opting for the Powerhouse Variety, you’ll get even more protein and fiber from the PB2, hempseeds, and/or chia seeds. Omega-9 Fats: Olive oil, especially when unheated, offers a variety of nutrients that benefit health. Most notable are the omega-9s. These fats do not increase inflammatory hormones like other vegetables oils, may actually reduce them while promoting anti-inflammatory action in the body. Furthermore, specific polyphenols in unheated olive oil contribute to heart health, cholesterol lowering, and cancer risk reduction (specifically breast, respiratory tract, and digestive). Antioxidants and Phytochemicals: The whole foods found in this recipe, including tahini, chickpeas, lemon juice, olive oil, and fresh garlic offer many antioxidants (like Vitamin C) and phytochemicals. For example, the sulfur containing nutrients and flavanoids in garlic are cardio-protective, possible fat-cell-production reducing, anti-bacterial, anti-viral, anti-cancer, and anti-inflammatory. A recent 10-year study from the Netherlands has shown a strong correlation between carrot intake and reduction in cardiovascular risk. In fact, carrots emerged as one of the most potent cardiovascular health benefactors among fruits and vegetables. On the other hand, even a better-than-most commercial hummus has issues. Take a look at these ingredients: Cooked Chickpeas (Chickpeas [Garbanzos], Water), Tahini (Ground Sesame), Soybean Oil, Garlic, Salt, Citric Acid, Potassium Sorbate Added to Maintain Freshness, Natural Flavors. At first glance, may not look too bad (and isn’t compared to some). But, take a closer look and you’ll see what’s missing: Olive oil. And, you’ll see what’s added: First, a good a dose of soybean oil. Again, soybean oil is a cheap oil often added to commercial condiments that doesn’t do our bodies a lot of good. In fact, its high concentration of omega-6 fats, compared to our meager intake of omega-3s, can set us up for lots of inflammation and inflammatory disease. As cyclists, it’s crucial to eat nutrients that promote health, energy, and recovery while fighting chronic inflammation. It also contains potassium sorbate (manufactured chemical preservative) garlic that’s not fresh, and un-named flavors. Of course you would never dump soybean oil, potassium sorbate, or unknown flavors into your hummus at home. You’d use olive oil and receive its beneficial nutrients including omega-9s and polyphenols. To learn more about fats and specifically omega-6 fats in condiments, click here. What other condiments would you like to make at home? Which do you worry most about when reaching for them at the store? Just like in training, sometimes you’ve got to put in the work. Convenience doesn’t always pay, and turns out, isn’t even always the most convenient. I’ll keep the recipes as simple as possible, and we’ll clean through the cheap chemical ingredients added to the foods in our pantries!